Actual fragment of Abraham Lincoln's blood-stained shirt from the night of his assassination (est. $25,000-$30,000). Finest known early Marilyn Monroe photograph, post-Norma Jean, taken circa 1947 (est. $20,000-$24,000). 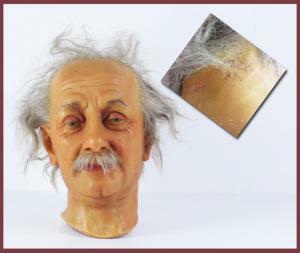 Rare life-size wax mold of Albert Einstein's head, with human hair, signed by him (est. $15,000-$20,000). 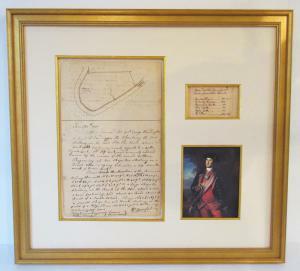 George Washington autographed manuscript with drawing, dated June 20, 1771 (est. $20,000-$25,000). Reproduction photo print signed by former Russian leader Joseph Stalin, taken in 1930 (est. $15,000-$20,000). They're just part of the selection of autographed documents, books, manuscripts and relics set to come up for bid in University Archives’ next online-only sale. WESTPORT, CONN., UNITED STATES, August 3, 2018 /EINPresswire.com/ — WESTPORT, Conn. – Important, historical items signed by Albert Einstein, Abraham Lincoln and Marilyn Monroe are just part of the incredible selection of autographed documents, books, manuscripts and relics set to come up for bid in University Archives’ next online-only auction, slated for Wednesday, August 22nd, at 10:30 am Eastern time. In all, 298 lots will be offered. Other names in the auction include such diverse luminaries as Napoleon Bonaparte, Catherine the Great, Ty Cobb, F. Scott Fitzgerald, Woody Guthrie, Ernest Hemingway, Bruce Lee, J. D. Salinger, Joseph Stalin and Orville Wright. The full catalog with all lots can be viewed online now, at www.University Archives.com. Internet bidding will be provided by Invaluable.com. There are several Einstein lots in the sale, including a single page typed, signed scientific letter (in English) on Kepler and Quantum Law, the precursors to his special and general theory of relativity, dated Nov. 3, 1942 (est. $10,000-$12,000); and a rare and astounding life-size wax mold of Einstein’s head, commissioned by him personally and created by Katherine Stubergh (the wax sculptress of the stars), with human hair and signed by him (est. $15,000-$20,000). 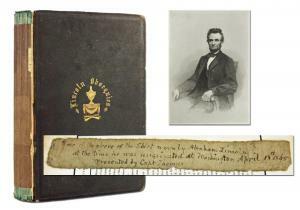 Lincoln also makes multiple appearances in the auction. Lots include a one-page letter written and signed by Lincoln in 1863, a few months after issuing the Emancipation Proclamation, with association to freed slaves who fought with Gen. Ulysses S. Grant (est. $50,000-$60,000); and an actual fragment of Lincoln’s blood-stained shirt from the night of his assassination, with superb provenance, plus a copy of the book Obsequies of Abraham Lincoln (est. $25,000-$30,000). Marilyn Monroe remains an enduring source of fascination to collectors. Several items signed by the screen goddess will come up for bid, to include the finest known photo signed by Monroe when she officially transformed from Norma Jean Baker to Marilyn Monroe. Taken circa 1947 and showing the starlet in a swimsuit pose, the 8 inch by 10 inch black and white photo is signed and inscribed with, “My very best wishes, Marilyn Monroe”. It should bring $20,000-$24,000. From the same era, J. D. Salinger is another figure with lasting appeal for collectors. The famously reclusive author of The Catcher in the Rye is represented in the sale by a single-page letter, written and signed (“Love, Jerry”) entirely in Salinger’s hand, and addressed to Joyce Miller, a longtime friend, confidante and possible lover (no one is really sure). The letter, from May 1950, is jubilant, playful and suggestive. The envelope is included (est. $9,000-$10,000). The five lots dedicated to George Washington include an autograph manuscript, dated June 20, 1771, unsigned but penned by Washington on a single page as a survey and plot drawing that mark off reportedly violent Indian lands in the Ohio Valley (est. $20,000-$25,000); and a letter written and signed by Washington in January 1785, in which he introduces an Italian nobleman (the Count Castiglioni) to Governor William Moultrie of South Carolina (est. $14,000-$16,000). A one-page letter written in French by Napoleon Bonaparte (1769-1821), signed by him, should command $2,000-$2,400. The letter, dated May 22, 1807 and written from what is now Poland, is regarding the surrender of Gdansk and the capture of the H.M.S. Dauntless. Also, a document from summer 1786 in which the Russian Empress Catherine II (Catherine the Great) promotes a Dutch engineer to the rank of Lieutenant Colonel, has a pre-auction estimate of $3,000-$3,500. A single-page letter written circa 1922 and signed by the author F. Scott Fitzgerald, to journalist Marguerite Marshall, in response to her interview of him following the publication of his novel, The Beautiful and the Damned, should garner $5,000-$6,000. Also, a two-page typed letter, signed by literary giant Ernest Hemingway, to the writer Peter Viertel, dated Aug. 8, 1948, where he discourses on writing, fishing, hunting, marriage and religion, is estimated at $4,000-$4,500. A rare reproduction photo print signed by former Russian leader Joseph Stalin, one of only three known and accompanied by great association and provenance, should hit $15,000-$20,000. 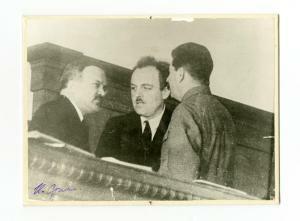 The photo, boldly signed by Stalin in Cyrillic (“J Stalin”), is from 1930 and shows two other men. Also, a single-page letter handwritten and signed by Clarence Anglin, an escapee from Alcatraz prison, to his mother, dated Feb. 19, 1950, with provenance, has an estimate of $2,500-$3,000. It doesn’t get any more diverse than Bruce Lee and Ty Cobb. An 11-page letter hand-penned and signed by Cobb, dated “8/29/59”, in which he makes predictions as to which teams will reach that year’s World Series, with envelope, should fetch $4,000-$5,000; while Bruce Lee’s iconic wood-handled rubber tube jump rope that the martial arts legend used for footwork training, is expected to breeze to $3,500-$4,000. The jump rope was gifted to Lee by a friend. Woody Guthrie’s two-page handwritten lyrics for a song he never recorded, titled Why, penned at the Brooklyn State Hospital in May 1956, where he was being treated for Huntington’s Disease, signed three times by the singer, should go for $5,000,$6,000; and an original piece of aviation pioneer Orville Wright’s plane, with a photo of the famous Wright Brothers’ first flight and a check signed by Orville, all in a matted display presentation, should make $3,000-$4,000.